It is possible to merge projects for which step 1. Initial Processing has already been completed in Pix4Dmapper. This allows the combination of information from different projects into one single project. The dataset is considered large for the capabilities of the available processing resources. When combining multiple flights or different acquisition types, e.g nadir, and oblique. Merging projects can speed-up step 1. Initial Processing time. It can also be used for projects having processing issues during step 1. Initial Processing with respect to memory use (not enough memory). Note: After merging, the subprojects do not have an impact on the merged project. They can be deleted, moved or modified. If a project is too large to be processed at once due to the processing resources, it can be split into subprojects. If the project has image geolocation, the project can be split using the Splitting Projects into subprojects options: Processing Large Datasets. If the project does not have image geolocation, the project can be split manually: How to split a project into subprojects. If a project consists of several flights, it is possible to process each flight separately and then merge the several subprojects. The coordinate system (both horizontal and vertical) of the images has to be the same in all subprojects. Note: A subproject with no image geolocation can be merged with a subproject with image geolocation. The GCPs have to be in the same coordinate system (both horizontal and vertical) in all subprojects. Note: A subproject with no GCPs can be merged with another subproject with GCPs. It is highly recommended the GCPs to be added in the merged project, especially when more than 2 subprojects are merged. The output coordinate system (both horizontal and vertical) of all subproject has to be the same. Note: A subproject with no georeference (arbitrary system) can be merged with a subproject with georeference. For more information about the Image / GCP / Output Coordinate System: How to select / change the Image / GCP / Output Coordinate System. 3. In Name, type a name for the merged project. 4. 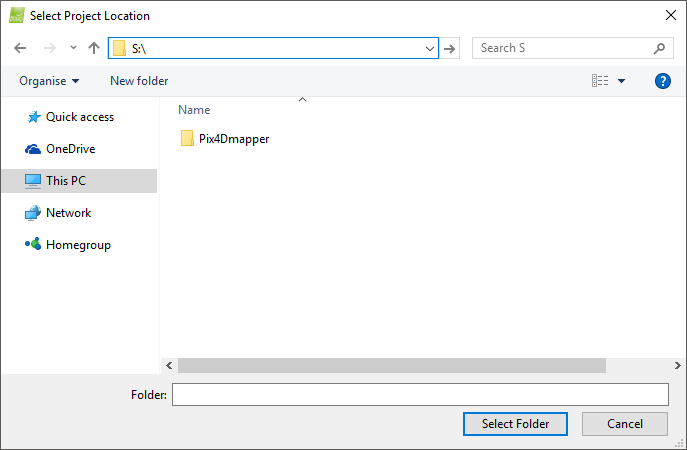 (optional) In Create in: click Browse... On the Select project location pop-up, navigate to select the folder where the project and results will be stored and click Select Folder. Note: A folder named after the project will be created in the selected folder and it will store all the results. 5. (optional) Select the check box Use As Default Project Location to save all new projects in the selected folder. 6. Selected the option Project Merged from Existing Projects. 8. On the Merge Projects page, the Duplicate camera parameters option is activated by default. If the camera model of the different projects is the same, it is duplicated by adding the name of the project at the end of the original camera model name. Note: This option allows the user to optimize the camera model of each project separately, which can enhance the results. The camera model can be edited once the project is created. Unselecting the Duplicate camera parameters option is recommended only when the camera and the environmental conditions (temperature, etc.) were the same for all the subprojects to be merged. 10. On the Select Projects pop-up that opens, browse to the project files. 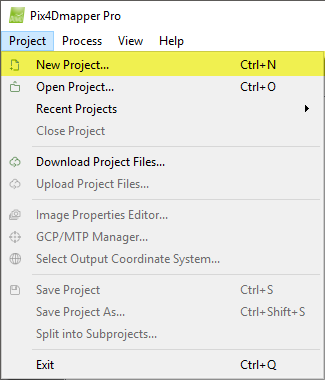 Select the projects to be merge (multiple selection is possible) and click Open. 13. Click Finish to create the merged project. 14. Automatically (no user intervention) the subprojects are combined and processed together. The final results of step 1. Initial Processing are generated. 15. Verify the Quality Report. One block should be created. 16. If more than one blocks are created, connect the blocks together by adding Manual Tie Points in the intersection / common area between the subprojects following: How to import and mark Manual Tie Points (MTPs). 17. On the Menu bar, click Process > Reoptimize. (Even if only one block was generated directly after step 14, it is recommended to Reoptimize). Warning: As there might be shifts between the blocks, it is important to connect the blocks together so that the reconstruction consists of one single block. Manual Tie Points can be used to connect the blocks together. If the shift is small, one Manual Tie Point might be enough. Otherwise at least three Manual Tie Points are recommended. If the original geolocation of the images is very accurate, click Process > Reoptimize might be enough to connect the blocks. 18. When the reconstruction consists of a single block, use the results to create another merged project, or start step 2. Point Cloud and Mesh and 3. DSM, Orthomosaic and Index. If at least 3 Manual Tie Points were marked in common area between the subprojects in each subproject, and if they have the same label in all subprojects, a pop-up appears when creating the merged project, asking if they are the same and have to be combined. If they are the same, then the software can join the blocks and create only one block. If there are not at least 3 Manual Tie Points when merging, two or more blocks are created. Therefore, after merging the projects it is required to add at least 3 Manual Tie Points in the common area and Reoptimize in order to obtain a single block. By generating the Quality Report it is possible to verify that one block was created. By checking the Automatic Tie Points displayed in the rayCloud it is possible to confirm the adjustment of the two projects.